I was working at my computer one day when my editor from American Girl called to ask if I’d like to try writing a mystery about Kit. I was excited about the idea, but a little nervous too. Lots of readers already knew and loved the character created by Valerie Tripp. I wanted to do a good job. The mystery plot was up to me to develop—as long as I stayed faithful to what readers already knew about Kit and her life. Before I could even think about writing the story, I needed to do a lot of research. I wanted to build on what readers already knew, but also explore a topic that hadn’t been covered in one of the earlier Kit books. The first thing I did was head to Cincinnati, Kit’s hometown. I spent several days in the big library downtown, reading old newspapers from the 1930s. I was looking for real events that might suggest a good fictionalized mystery story. I quickly learned how important the zoo was to Cincinnati citizens during the Great Depression. 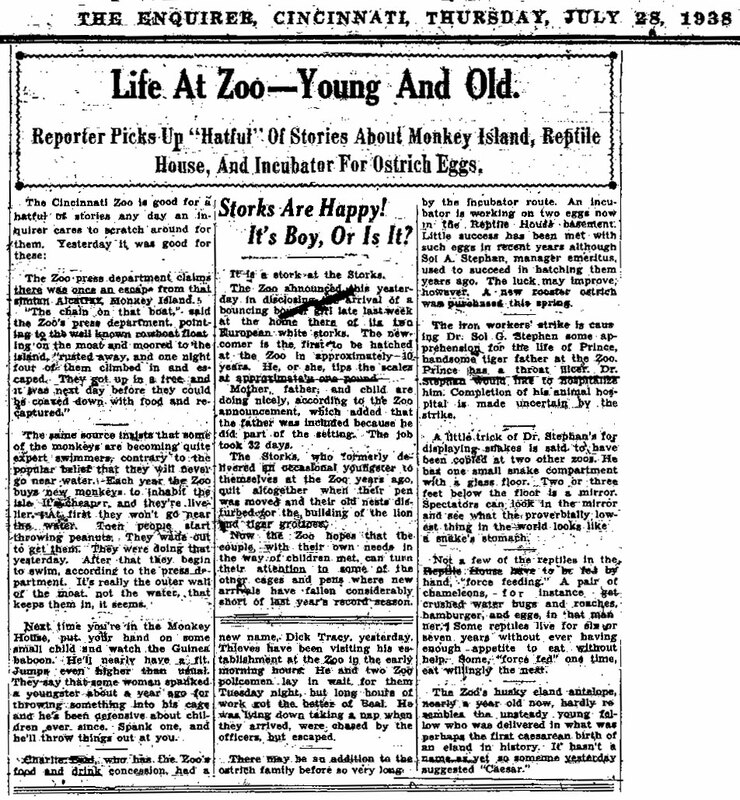 The newspapers were full of articles about the animals, events at the zoo—even details like when fences got painted. I decided the Cincinnati Zoo would make a great setting for Kit’s mystery! Here’s a good example of the kind of article I found so helpful. Can you find the details that made their way into Danger at the Zoo? The article above is from the July 28, 1938 issue of The Enquirer. While doing research, I’m always looking for details that can help build suspense in a mystery story. When I read the article and learned that the Guinea baboon threw things from his cage whenever he saw a child being mistreated, I knew I could use that in the climax scene of the book. The article below is from the July 4, 1935 issue of The Enquirer. 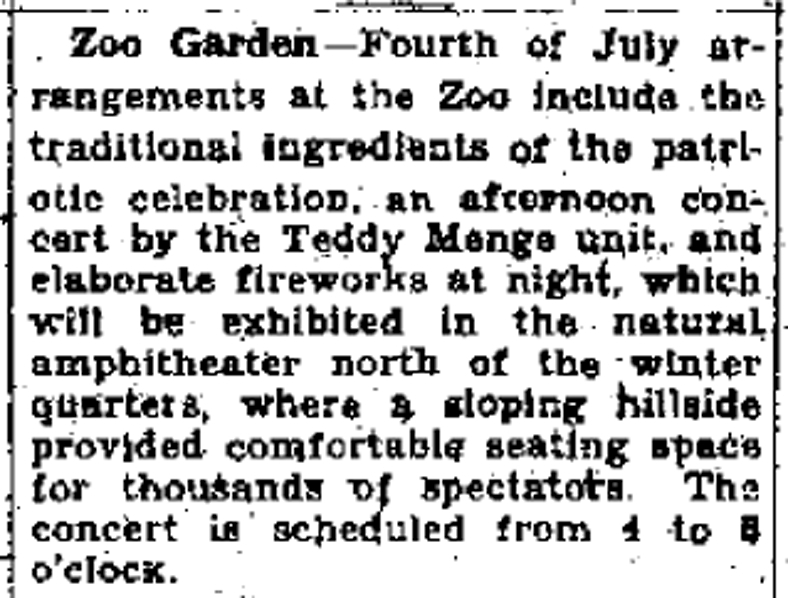 The zoo’s Fourth of July celebration gave me the perfect setting for the big confrontation scene in the Monkey House. And here’s one of the articles I found about a strike at the zoo. It is from the May 16, 1935 issue of The Enquirer. 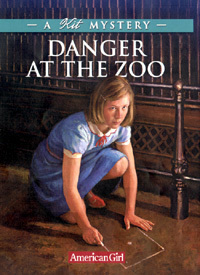 Knowing that there was tension between some of the zoo workers and the zoo managers helped create a mood for the story, and gave Kit some possibilities to think about as she considered her suspects. Newspapers don’t last forever, so many libraries and museums actually photograph local newspapers. The result is a roll of microfilm, which can be read on a special machine. When I find an interesting old newspaper article, I’m usually able to print a copy of it. As you see, sometimes the print quality isn’t always the best. The articles I’ve included here have actually been enhanced a bit in Photoshop, so they’re a little easier to read than my original photocopies were. Next stop, the Cincinnati Zoo! 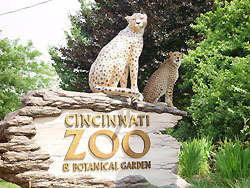 The Cincinnati Zoo & Botanical Garden is one of the oldest zoos in the whole country. I learned that the building used as the Monkey House in the 1930s was still standing. In fact, it is said to be the oldest zoo building still in existence in the United States. Though it was fun to visit the Monkey House building, I discovered that it looks very different today than it did during Kit’s time. I needed to see old photographs of the zoo so I could describe it accurately in Danger at the Zoo. 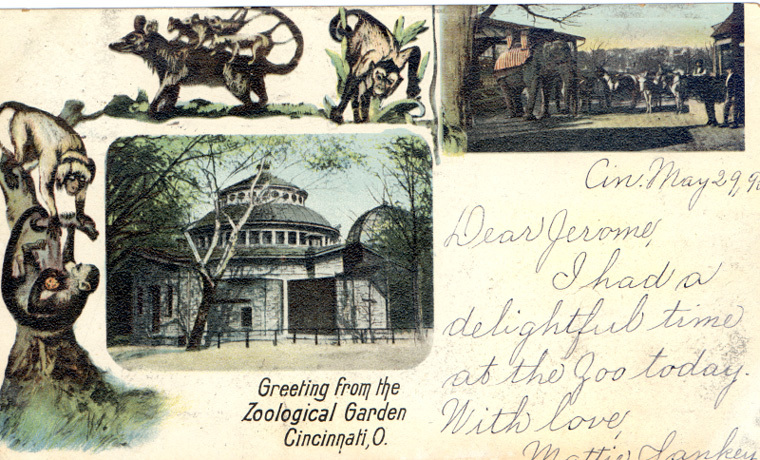 The postcard below is postmarked 1918, and I imagine this is similar to the zoo landscape that Kit, Stirling, and Will would have known in the 1930s. The view of the Monkey House shows some of the outdoor cages attached to the building, where animals were kept during warm weather. Notice anything different about the caption at the bottom of the postcard above? During Kit’s time, the zoo was known as the Zoological Garden. 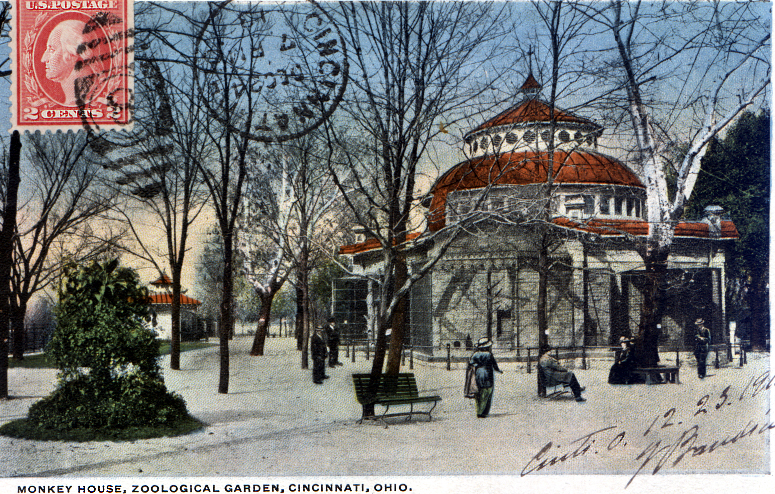 Today, its full name is the Cincinnati Zoo and Botanical Garden. A century ago the grounds were much more open and park-like than they are now. But the grounds have always been beautifully tended, and an observant visitor can learn a lot about animals and plants during a visit. The pictures below are also from postcards. This one shows Susie the gorilla in her cage. 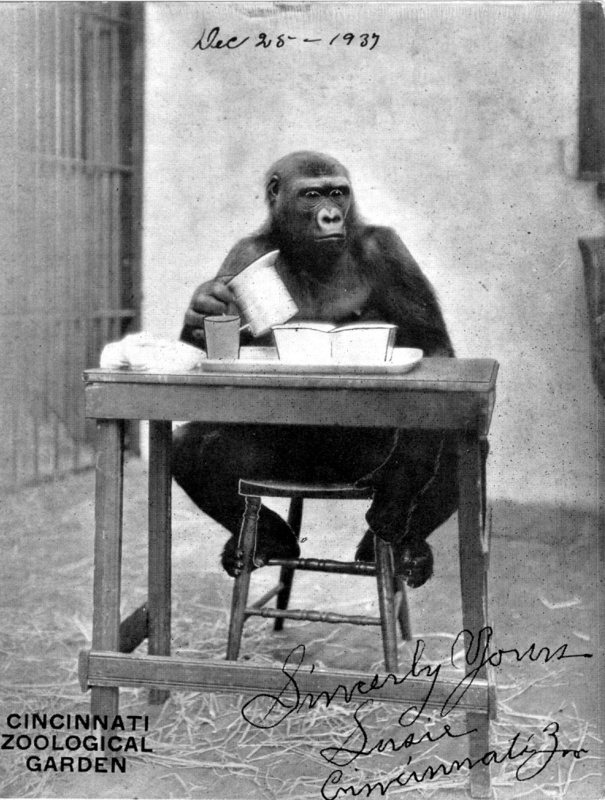 During the 1930s, visitors to the Cincinnati Zoo loved watching her eat. Here’s another old photo from the zoo. 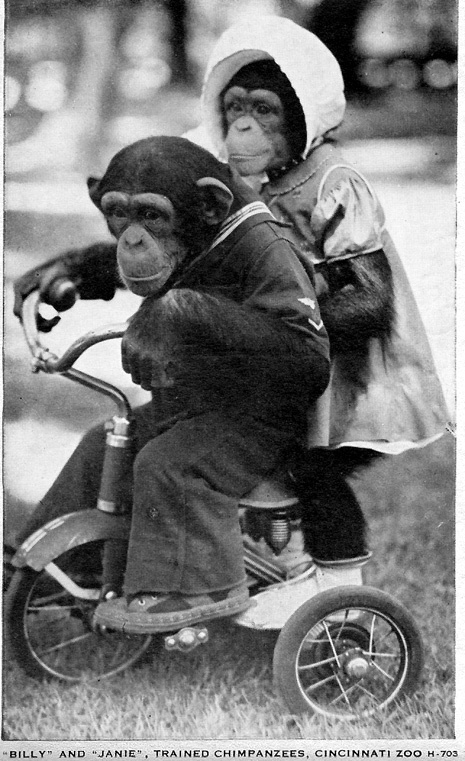 I didn’t end up including Billy and Janie in the mystery, but in Kit’s time people enjoyed performances by trained chimpanzees. During the 1930s, people’s attitudes towards animals and their lives in zoos were changing. Workers at the Cincinnati Zoo were replacing cement-and-bar cages with more natural enclosures for animals. Do you think Susie, Billy, and Janie should have been left to roam about a natural area of the zoo, or do you think it was OK for keepers to dress them up and train them to perform?